If you want to create a party atmosphere, you need the new Startec Rayzer from ADJ. Combining two high-octane effects into one compact and easily portable unit, this unique fixture is ideal for amping up the energy at house parties, mobile events and in small-to-medium-sized bars and clubs. Part of ADJ’s Startec Series of affordable high-impact lighting fixtures, the Rayzer brings together a tri-color laser projector with a multi-zone RGB wash effect in one convenient unit. This allows it to generate piercing midair beam effects for those ‘reach for the sky’ moments, as well as vibrant washes that will fill your dancefloor with richly saturated swathes of color. The fixture’s laser projector is located right at the center of its circular face and combines red, green and blue beams to create a wide variety of striking effects. When used with fog or haze, the Rayzer’s beams will cut through the atmosphere creating impressive mid-air beam projections. But even in haze-free environments, the unit’s complex geometric patterns can be used to add interest to the walls, ceiling or dancefloor of a venue. For its wash element, the Rayzer makes use of 126 0.2W SMD5050 3-in-1 RGB LEDs, which are arranged in seven concentric circles expanding out from the central laser aperture. Each of these seven rings of LEDs can be independently controlled, which allows for impressive multi-colored chasing ‘eye-candy’ effects to be created in addition to solid washes of color. The LEDs can also be set to strobe, at variable speed, which is yet another string to the Rayzer’s bow. Offering maximum flexibility, the Rayzer can be used in a variety of different ways. If you just want a fixture to get the party started with minimum fuss, the Sound Active and Show Mode allow the unit to run its inbuilt color wash and laser patterns as a standalone effect – just set it and forget it! 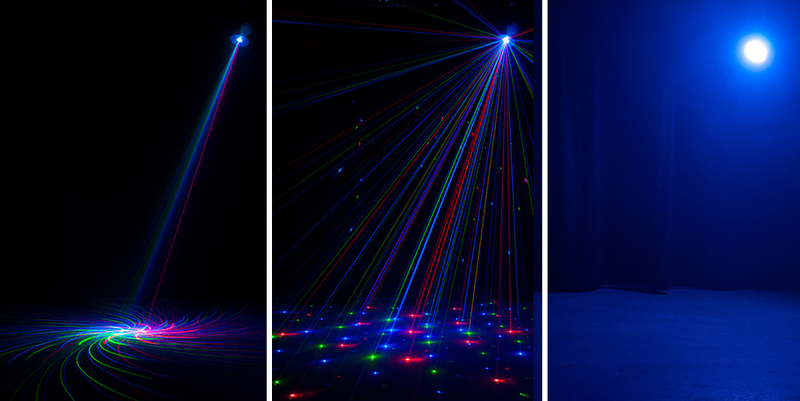 On the other hand, if you want to trigger the laser effects yourself and match the color washes to the vibe of the party, every aspect of the effect can be controlled using any DMX-compatible hardware or software system via 26 control channels. If you choose to invest in more than one Rayzer fixture, it is also easy to link together multiple units in a master/slave configuration to create an impressive multi-head synchronized light and laser show. A four segment LED display, together with four corresponding push buttons, are located on the rear panel to allow mode selection and DMX addressing. In addition, a safety key lock is provided for switching on and off the laser beam as well as a heavy duty loop for securing a safety chain. 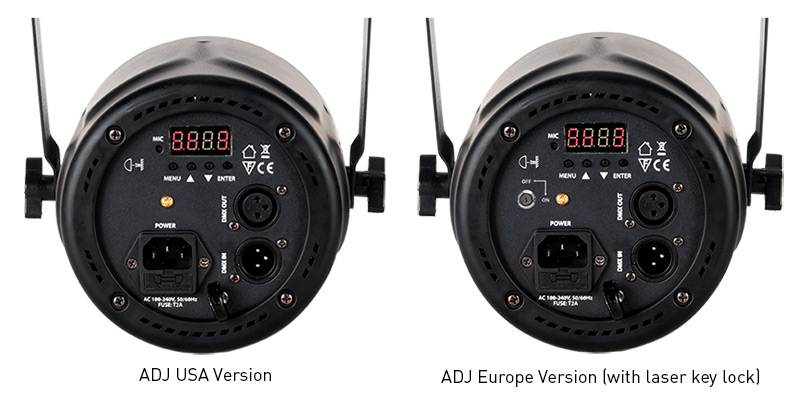 The back of the unit is also home to the 3-pin XLR input and output sockets for DMX control and master/slave linking, as well as the IEC power input and output sockets. The inclusion of the output socket means that the power supply to multiple fixtures can be linked together from a single socket, reducing cable runs and making for a quicker and easier setup. Sporting a sleek, lightweight plastic case design that is also extremely robust, the Rayzer features an integrated hanging bracket that can be used for fixed installation or temporary rigging to a T-bar stand or truss structure. This makes the unit perfect if you’re a mobile entertainer on the move but also if you’re looking for a versatile lighting fixture to inject energy into a venue on a permanent basis. With compact dimensions of 8.25” x 8.5” x 9.25” / 210 x 217 x 235mm (L x W x H), the Rayzer is ideal for installing in tight spaces as well as for mobile entertainers with limited storage and transportation capacity. Thanks to its low weight of just 5lbs. / 2.2kg., it is also extremely easy to lift, carry and rig, making it ideal for use out on the road. Offering an eye-popping combination of animated wash patterns and dazzling laser beam effects, the Startec Rayzer is ready to get any party started. And, with no duty cycle, it will keep the party atmosphere pumped up from start to finish! The Startec Rayzer is available now from ADJ USA.